I recently attended the 30th Annual Academic Chairpersons Conference. At the conference, I attended a great workshop by Dr. Kent Crookston, a faculty member at Brigham Young University, on decision-making. In his presentation, entitled "Three Keys to Effective Decision-Making," he presented what he called the three key components for decision-making. Be Proactive - take responsibility for your own life and for your work. Be Humble - demonstrate a "compelling modesty," act with calm determination, and never blame other people or things for poor results. Be Composed - even under stress, it is vital that we control our fight or flight responses and deal with issues and problems in a composed manner. Really this is a principle-centered approach for making decisions. This approach makes a lot of sense and likely yields great returns. One issue, though, is that this process can take some time to work through, and often there is a limited amount of time available to follow the process. The second is what I call the "intuitive" approach to decision-making. This is really the gut-reaction approach and operates under the assumption that the process approach is rarely used in the real world because takes too long to follow the process. It seems that these two approaches are presented as a dichotomy - two distinct and entirely different approaches. However, I believe that there is a continuum between these two approaches to decision-making. It is probably somewhat rare to follow the "scientific" approach in its entirety; however, an individual or group may use some of the general steps identified above and therefore would find themselves between a purely scientific approach and a more intuitive approach.The more data we gather and analyze, the more scientific our approach. The less data we have gathered, the more intuitive the approach. I would assert that in every decision, at least some of the steps in the process are followed, and the individual has some sort of an intuitive sense of what the best decision is; therefore, the idea for a continuum holds. In reality, all three of these approaches can (and likely should) be used simultaneously. The scientific provides a framework and a sequence for making decisions in a methodical manner. The intuitive allows the individual to remain true to their intuitive sense. And Crookston's approach enables the individual to stay centered on principles that facilitate the successful application of both the scientific and the intuitive. To make an effective decision, a leader must use each one of these strategies. If the "scientific" process approach is not used, then there is no critical thinking and the decision will likely be flawed. If the intuitive approach is not used, then the decision may not resonate with the needs and desires of the one making the decision. And if Crookston's principles are ignored, then unhealthy behaviors and attitudes will short-circuit and cloud the decision, thus compromising the effectiveness of the decision. To these three decision-making strategies, I would also add a sub-component: technology. This can include any tool or technique that makes a decision-making task more efficient or effective. Technologies include any tool or model that facilitates steps in the decision-making process. 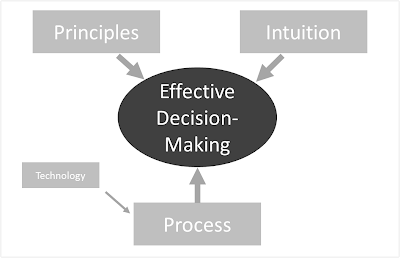 The image below summarizes these four components of effective decision-making. The context in which decisions are made plays a crucial role on how these components are utilized by the decision-maker. For example, if there is little access to needed technologies, then the decision-making is altered; if there is very little time to make decisions, then the decision will likely land closer to intuition on the decision-making continuum. In an ideal world, all four of these components should be utilized to their fullest to ensure that decisions yield the most favorable results.